This classic pocket effect, in which a metal ball mysteriously sinks and rises in a metal tube with a smaller circumference than the ball, is believed to be the invention of János Bartl. 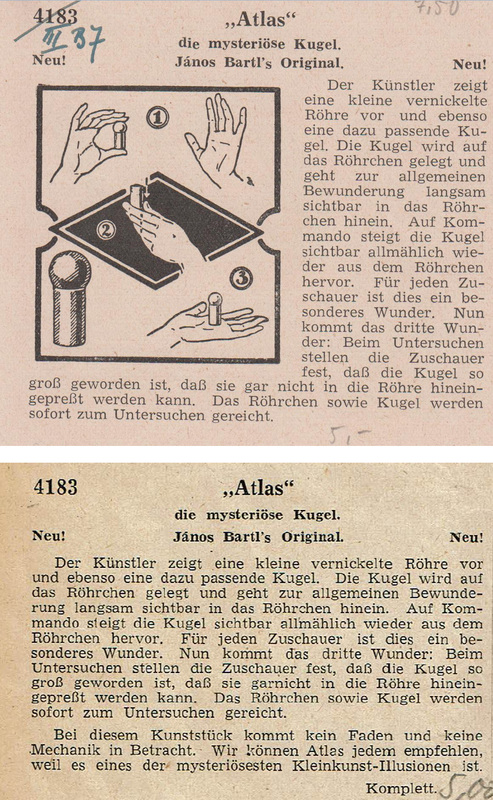 Bartl marketed the trick as “Atlas, die mysteriöse Kugel” (Atlas, the Mysterious Ball), c. 1925 (instruction sheet). Bartl prominently featured the words “Neu!” (new!) and “János Bartl's Original” in his ad, claims he used sparingly. The first listing for the trick seems to be in a Bartl advertising sheet, Magische Edelsteine, posted in July 1925; see Peter Schuster's Collection Adolphe Blind "Le Professeur Magicus", 2007, item 59. The trick was mentioned among Bartl's new releases in The Linking Ring, Vol. 4 No. 1, c. Jan. 1926, p. 18. The next year, Bartl's trick was knocked off by the Princess Novelty Shop of Chicago, who called it “Squeeze”; see The Billboard, March 5, 1927, p. 42. Their claims went only as far as “Our Own Construction”. Carl Brema has occasionally been mentioned as the inventor of the Ball and Tube, but his first ads for “The Atlas Ball and Tube Mystery” didn't appear until January 1929 (see The Sphinx, Vol. 27 No. 11, p. 533). The mention in Brema's ad is modest. There are no claims for originality and Bartl's name for the trick is used. Brema's instructions were written by Leslie P. Guest and make no attribution of invention. Brema did later invent and claim a locking-tube version of the Ball and Tube, first advertised in 1935; see The Eagle Magician, Vol. 6 No. 12, Jul.-Aug.-Sep. 1935, rear cover.